SBEP is "Toasting the Coast" in support of National Estuaries Day on Saturday, September 28! 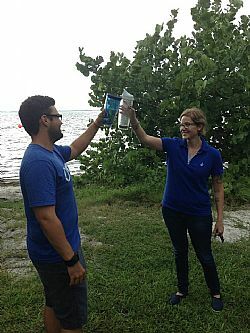 The Sarasota Bay Estuary Program is joining its 27 sister National Estuary Programs around the U.S. in a nationwide "Toast to the Coast" in honor of National Estuaries Day on Saturday, Sept. 28. We invite you to join us by lifting a glass, mug, or cup in a salute to our very own Sarasota Bay. Snap a picture of yourself or a group of friends toasting to Sarasota Bay and email to info@sarasotabay.org to enter SBEP's 'Toast to the Coast' photo contest. Creativity is encouraged, but all pictures must show Sarasota Bay in the photograph. Please be sure to reference where the photo was taken. Those wanting to participate should submit a picture by Monday September 23rd. Later that day, an album will be posted on the SBEP facebook page with all the submissions. The picture to get the most "likes" via the album will be named the winner on National Estuaries Day, September 28. The winning submission will receive four Sarasota Bay Explorers tickets.